This 60 min restorative yin sequence is a full class offering the best of yin yoga and restorative yoga. Through props we will apply the first principle of yin and find the appropriate edge, that place where we can experience sensation, but not too much intensity. Too much intensity in a yin yoga pose keeps the chi up at the surface level of the muscles and fails to coax the chi deeper into the dense layers of connective tissues, bones and the subtle energetic meridian pathways. 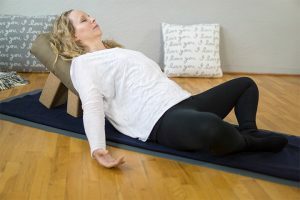 In this restorative yin class we will pay close attention to our bodies and soften those hard edges that we often push ourselves towards on the yoga mat and in life. Through the use of yoga props and non-abandoning attention we can offer ourselves tender care and consideration through this gentle yoga practice. Poetry from David Whyte will round out our contemplative practice. To embody the principles of yin in a deep way, join our membership community. In November we will be focusing on the principles of yin.